September is almost here, and with it, the next book in The Extraordinary Days series! 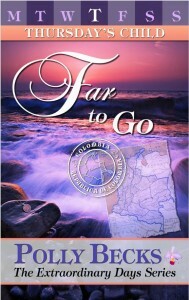 THURSDAY’S CHILD: Far to Go is the story of Elisa Santiago, successful Obergrande attorney, who finds out in one explosive day that her whole life has been a lie. Elisa’s family is originally from Colombia, so a serendipitous family wedding in Medellin this summer was the perfect opportunity to scope out fascinating locales and soak up some authenticity…and a little refajo to drink. I rode the metrocable for an overview of the city, and I was able to visit the Museum of the Past (Museo Casa de la Memoria) where Elisa will come face-to-face with her nation’s bloody past…and her own. Meanwhile, back in Obergrande, plans for the Quadricentennial are progressing, several people are having issues with their mothers, and there may even be a wedding…I hope to see you there in September, when THURSDAY’S CHILD: Far to Go is released. Preorder your copy today!